Computer Essay. Welcome to our website. This is the one of the best and an unlimited the source of Essay and Paragraph. 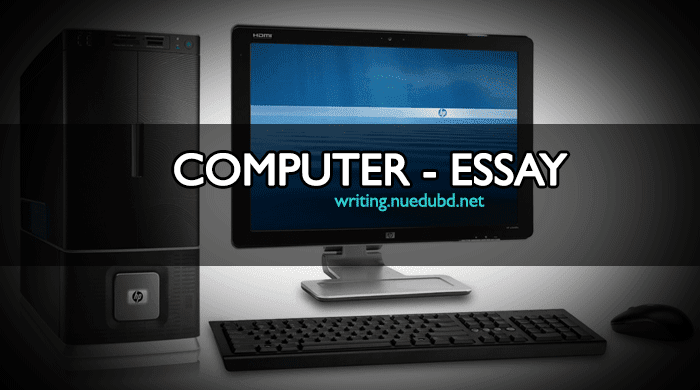 Now NU EDU BD writing section sharing the most useful Computer Short Essay for you. I hope you'll like it. Education is one of our basic rights. This is very short and easy essay for you. Now check this out Short composition on Computer Essay for you. Introduction: Computer; is an electric brain. it works like a human brain. It is the most useful and wonderful invention of modern science. Now we cannot imagine a single moment without this wonderful invention It is an inseparable part of our modern life. It has made our life easy. History of the invention: the computer was not invented overnight. It looks like a long time. Charles Babbage, a British mathematician, thought about this electric brain fast. For this, he wrote a formula. later an American scientist, Howard Akin invented the computer in 1937.
kinds and functions: There are two kinds of computer. They are Analogue computer and Digital computer is used. A computer mainly does three functions. These are data receiving, data processing and delivery of data. How works: A computer has some units. The units have respective functions. It has a memory unit. It helps to store all data The input and output units help to receive information. Its arithmetic unit is an important one. This unit can do a complicated calculation so easily. Its uses: now the computer is used in all walks of our life. It is used in education. It is used to prepare results. It is used in printing books, preparing lessons etc. The computer plays an important role in diagnosis. Almost are printed quickly for it. Business, commerce, mills, factories, agriculture sector use a computer. Modern banking system greatly depends on the computer. Demerits: IT has some demerits. As it is doing almost every work, we are becoming idle. Besides, it is increasing the unemployment problem. so, social and national problems are on the rise. Conclusion: In the end, we can say that we cannot imagine our life without the help of a computer. It is being used for the welfare of mankind. IT has made our life easy and comfortable. IT has lessened our time. in fact, the invention of the computer is a blessing for us.